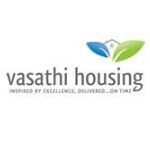 Vasathi Housing Limited is an certified organization that is committed to excellence and on time delivery. Established in the year 2009, Vasathi has acquired a prominent position in a short span of time through building energy efficient and environment friendly residential projects. Vasathi Housing offers lasting value, with an emphasis on contemporary designs, optimized layouts and cutting-edge technologies. Vasathi homes are elegantly designed, spacious and have contemporary interiors. It is one of the few players in South India that offers third party quality inspection by BUREAU VERITAS to ensure highest quality standards. Dedicated to be green compliant, Vasathi homes are designed as per LEED guidelines.